It was another fun packed day in Beijing! We began the day at Beihai Park. It used to be the park for the Emperor's summer home, but it is now a public park where local Beijingers go, especially to do their morning exercises. It was a beautiful park around a lake with a Buddhist temple. We saw many people doing various activities, such as dancing, Tai Chi, running, Kung Fu, badminton, singing, and writing calligraphy with water on the ground. We walked from one end of the park to the other exited in the hutong, the old village. Here there were many of the tricycles that carry both tourists and locals, much like taxis in New York. We walked through the hutong to Prince Gong's Palace. 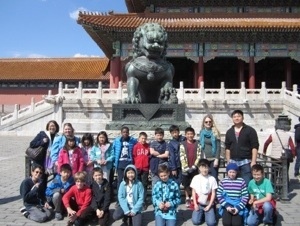 We were able to visit the palace and see the beautiful art, architecture, stonework, painting, and garden. We learned that the green roof of the palace was to signify that it was for the Prince. Regular people were not allowed to use green for their roofs. The decorations were based on happiness, and the word happiness was on several walls. There was even a small lake in the shape of a bat because the Chinese word for bat ha the same sound as the word happiness. After the palace, we walked back through the hutong and saw people roasting bugs to eat. We passed the lake, and the teachers were thrilled to find a Starbucks to grab a quick coffee while the kids rested. We went to a famous restaurant for lunch to have Peiking duck. The restaurant was a huge building with many floors, and many famous people, specifically world leaders, have eaten there. The food was delicious! We took the bus to Tiananmen Square. 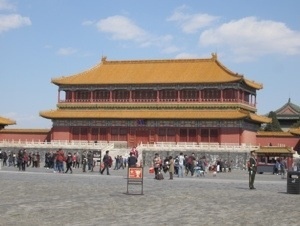 The square is symmetrical and is the entrance to the Forbidden City. We were once again quite popular with the locals. Even the small children wanted to take a look at the "foreigners." 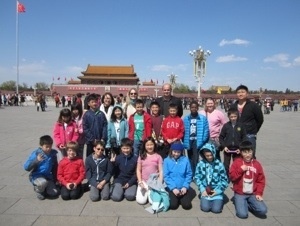 We took a group photo in front of the Forbidden City before heading in. The Forbidden City is beautiful and enormous! It used to be the Emperor's Palace, and fortunately, it is now open to the public. The roofs in this palace are yellow to signify the social status of the Emperor, just like the green roofs in the Prince's palace. We saw many different parts of the palace, such as the living quarters, the Emperor's office, and the courtyards. The children were shocked that there were no trees in the courtyard, and they were fascinated to learn that this was because the Emperor didn't want anyone to be taller than him. He was also quite paranoid and thought that assassins would use the trees to hide. While visiting the sleeping quarters, we learned the Emperor would have as many as 3,000 concubines at a time living in the palace. Our guide also told us that the palace has more than 800 rooms. We had a short ice cream break in the courtyard of the living quarters, and not only were people taking pictures of us eating ice cream, someone also drew a picture of one of us on a plate. We left the Forbidden City to eat an early dinner of dumplings before boarding the night train to Hangzhou.